We receive comments like this frequently at StudyOrgo. To summarize the student’s dilemma, it sounds like the first two tests worth of material in organic chemistry were the basics: learning to name compounds, bond hybridization, sigma and pi bonding, maybe even some thermodynamics and bond energies. But now that you have covered these fundamental principles, it is time to put them into practice and learn about specific chemical reactions and their mechanisms. In this course thought, the quantity and variety of reactions can be just as overwhelming as their complexity. This is usually where it the course goes sideways for students, and a feeling of panic and despair replaces any confidence you felt about the material before. When asked if this website will help a student in this predicament, our short answer is “YES!” What is likely this student’s trouble is either some important concepts critical to the new material were missed or not understood as well as previously thought. It happens all the time. Many times, students will tell us that the teacher “blew through” or “went really fast” over some material and the student missed it. After we re-learn the materials presented on the website, the student can be acing the practice problems! 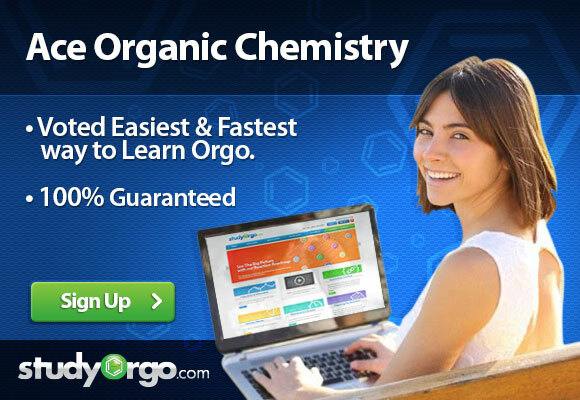 What you need to move forward is to solidify the base of your pyramid of organic chemistry knowledge. You were off to a good start, but something went wrong somewhere, and we have the expertise to help. We at StudyOrgo have spent countless hours reviewing and preparing the material in the most crystal-clear and “get-to-the-point” manner as possible. We consult students and ask for their opinion on whether they get it based from the tutorials we present. Once you are ready to move on past the basics, we take a step-by-step approach to going over every chemical reaction commonly taught in the course. We make a note to point out important points, Markonvnikov v. anti-Markovnikov selectivity, syn or anti addition, stepwise v. concerted mechanism, etc. By the time you finish the tutorial, you will be ready to practice you problem sets and you will be ready to ace the next test!